Earlier today, we reported on the airliner that crashed into a highway while attempting to land at a Moscow airport, killing at least four people. As many drivers do in Russia, somebody had a dash cam running at the time, and they managed to capture the horrible incident on video. 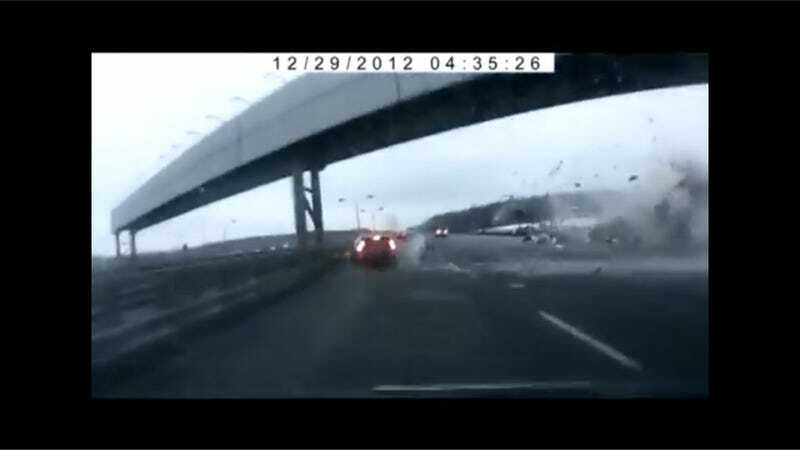 It shows the plane colliding with the road, sending snow and debris flying toward the driver's car and an SUV that was in front of it. It's quite chilling to watch, especially considering the fatalities involved. The crash split the plane into several pieces. The BBC updated their story to say that the dead included two pilots, a flight engineer and a flight attendant. Four others were seriously injured. The cause of the crash remains unknown, but the BBC says "investigators are looking into three possible causes - bad weather, technical failure and pilot error."